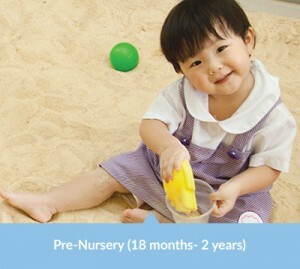 Our Nursery programs are structured as Full-day and Half-day Childcare options. The move from Pre-Nursery to Nursery 1 is an exciting time. Your child can express thoughts through words or exhibit emotions in many ways. You will be amazed how quickly your child can pick up words, phrases, songs and rhymes from teachers and friends. 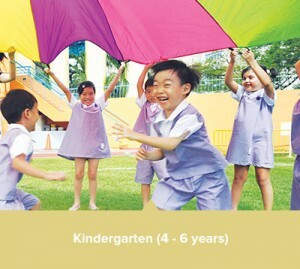 We make sure that our Nursery 1 programs provide a range of activities as endless as your child’s imagination. Adopting the A-S-K framework, our programs include the building of creativity, language skills and concept knowledge alongside character and attitudes. Activities like construction and block-building, painting and drawing, outdoor and indoor gross motor play are coupled with dramatic play and dress-ups, puzzles, music, movement, singing and drama. Games, reading and story-telling also aid to promote social interactions and relationship skills development. Our Chinese curriculum further reinforces Habits of Mind through the association with famous Chinese teachings of “Di Zi Gui” ( 弟子规). With practical applications and reinforcement, children are able to embrace and practice the habits introduced to them in a meaningful way. 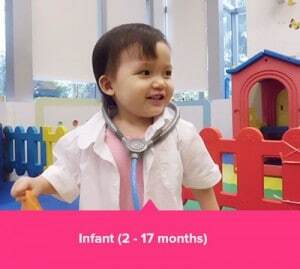 Our Nursery 2 program provides opportunities for children to expand their repository of knowledge, cultivate their strengths and interests, and build rock solid academic foundations. Children embark on a structured 3 year UK phonics program (Rigby Star Phonics) to help them acquire skills to blend and decode words in their early reading adventures. Children complete all the letter sounds in Nursery 2 before progressing to digraphs and trigraphs subsequently. Children also learn more about writing, vocabulary, grammar and comprehension. They further build their Numeracy concepts and number sense through games and activities that build their passion for learning. In Nursery 2, we step up a notch with our Reggio Emilia inspired project inquiry approach. While this component was introduced to our Pre-Nursery and Nursery 1 children, they were guided a lot by teachers and the topics revolved around their everyday encounters. At Nursery 2 however, children are now able to fully experience the benefits of the project inquiry approach. They are given more autonomy to choose topics of their interest. They are actively engaged in class discussions, group work, and supported by their teachers to explore and find answers to their questions. Field trips, interviews, and experiments pertaining to individual projects are arranged to allow children to be fully engaged in their project investigation. With 2 English and 2 Chinese projects in a year, children will have ample opportunities to apply their language and numeracy skills through the investigation, documentation of learnings in drawings and writing, and dramatization through different forms of project presentations.